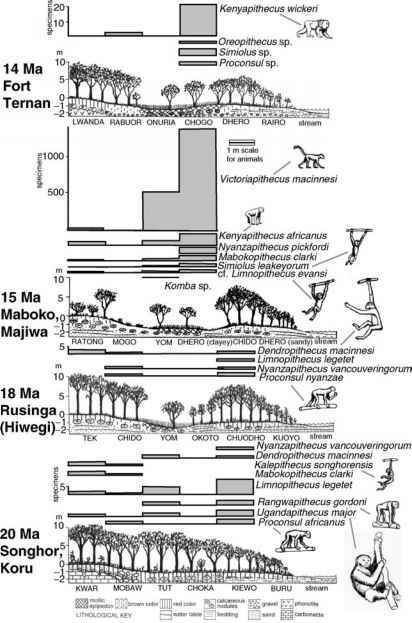 After Reineck and Singh 1980.
and fossilization. Fortunately, sediments sometimes contain biological factors, faunal and floral remains, in different stages of preservation. The appearance of animal remains in a sedimentary matrix depends on its so-called taphonomic history. The taphonomy (Efremov 1940) includes the two processes, biostratinomy and diagenesis, that describe the pathway from a carcass to a fossil. Biostratinomy (Weigelt 1927) deals with everything that happens to a carcass after an animal's death, before the remains are buried. Afterward, the fossilization process, including mineral exchange and compaction, is called diagenesis. The fossilization process reduces information about an animal, but it also tells us a story that contains information about the paleoenvironment. The possibility that parts of a given animal will survive for some million years is relatively low due to taphonomy. Fossils are not randomly distributed. There are only a few spots on earth where we can find mammal remains, and there are even fewer places where we can discover hominid fossils. In most assemblages of large mammals from a single locality, the abundance of hominid specimens is less than 0.5%. Nevertheless, the number of collected fossils has increased rapidly during the last decades. More and more research teams, with sophisticated survey strategies, explore for and investigate new fossil sites. Extensive sedimentologic and tapho-nomic analysis at known localities leads to a broad understanding of fossil site creation. Commonly, the geographical distribution of hominid localities is used to interpret the origin of mankind and the migration patterns of early hominids (Coppens 1994). One has to consider, though, that the interpretation of the biogeography of a species or even of an evolutionary lineage, can be heavily biased by the factors mentioned earlier, as well as by others, such as those controlling the burrowing and preservation of animal remains. White (1988) pointed out that the fossil record in eastern Africa is biased toward a representation ofthe watered axial basins. Classic hinterland sites lacking permanent water sources, e.g., Laetoli, are rare indeed. But this does not imply that these were minor constituents; they may just have not been discovered yet. The preservation of fossils is heavily dependent on the sedimentological environment. Fluviatile milieus do not necessarily grant a permanent burial; many of the fossil localities in eastern Africa are associated with rivers, and a migrating channel bed can alter even a lake margin or floodplain within a short time period. Chances of finding an original bone association decrease with the transport distance from the point of origin. When discovered, the bone assemblage is likely to represent different individuals from different localities and different time periods (Hanson 1980). Time averaging, the mixing of noncontemporaneous populations, has to be considered when interpreting the history of bone assemblages. Nevertheless, beside sedimentological factors, the effects of time averaging are also dependent on stable or highly fluctuating populations (Behrensmeyer and Chapman 1993).